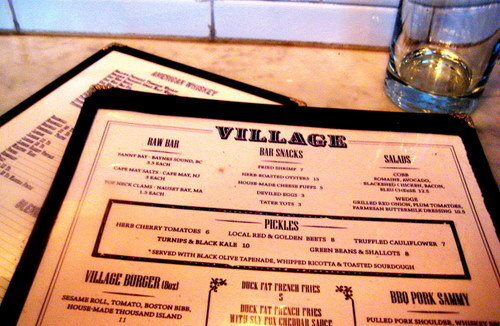 The last time we tried to go to Village Whiskey to get a burger, there was a ridiculous wait. And I hate waiting for food. This time, we somehow lucked out with one of the counters in the back, even though we only got one chair. It was the last non-table space and we snagged it! So who the hell cares if one of us had to stand? So I guess this place is mostly for boozing, but as far as food goes, everyone raves about the burgers, so that’s what we got. I got the village burger with caramelized onions, done medium well. It comes on a good sized sesame roll with tomato, boston bibb lettuce, and a house-made thousand island dressing. I was a bit wary of the dressing so I asked for it on the side. Once I tasted it, I really liked it, so onto the burger it went! So the patty is pretty thick and mine was cooked the way I like it, not at all bloody. And the caramelized onions were plentiful and also delicious. In all, this was a good burger! The meat wasn’t chewy and it just melted. J got his burger medium so it was pretty bloody on the inside. Seeing as how thick the patty is, it seems pretty easy to keep it bloody. He thinks it doesn’t have to be such a thick patty. And he dug the thousand island sauce as well. Oh, it also comes with a pickle. So people rave about the duck fat fries too, so we split a share of those. These fries are not plentiful at all. In fact, we think they line that silver cup thing with paper so that they can put even less fries in there than they can actually fit. They were good, but nothing amazing or life-changing. And we got the sly fox cheddar cheese sauce. It was melted cheese. There wasn’t anything sly foxy about it. It just tasted like a mild melted cheese. Don’t get me wrong, it was a tasty mild melted cheese, but is it really worth it? Meh. Overall, I enjoyed my burger a lot, but do I think it’s the best burger in all of philadelphia? I don’t quite think so. But that’s just me! Dude. you ordered it medium well. Your opinion is disqualified. Ha, totally. High quality beef, like at VW, deserves to be medium rare. My top three are from VW, Royal Tavern, and Pub & Kitchen – and no one else really comes close to them, in my opinion. Rouge? Give me a break. So what would be your favourite/best burger in the city? For me it was VW (even though the last one or two times were disappointing), but totally trust your opinions enough to try out any contender you would deem worthy! 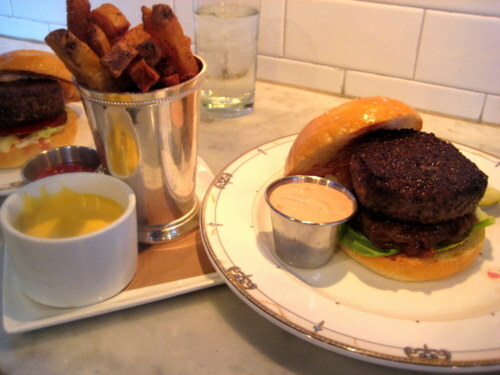 i thought salt & pepper had an awesome burger… and i enjoyed my burger at sketch immensely! but i probably haven’t tried enough to really know yet!